Many home owners and renters list a luxury bathroom as one of their top desires in a home. 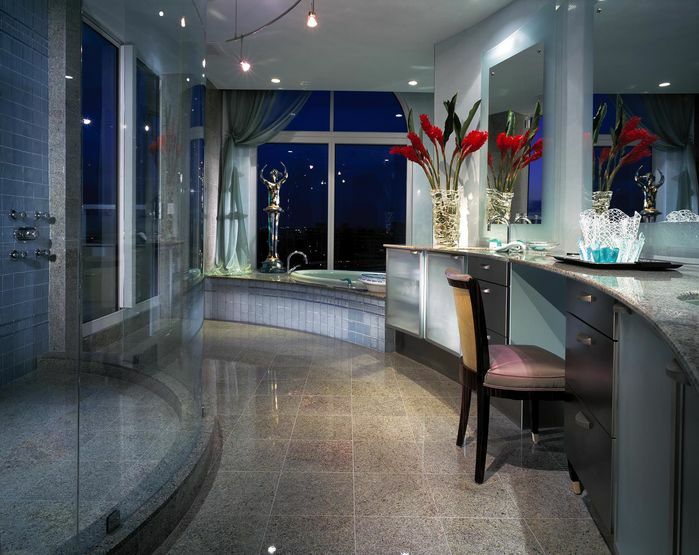 Rich materials, updated lighting, large showers and beautiful soaking tubs set the scene for the luxury bathroom. Add to that stunning accents and lush linens for a completely luxurious bathroom that elevates this space into an oasis. 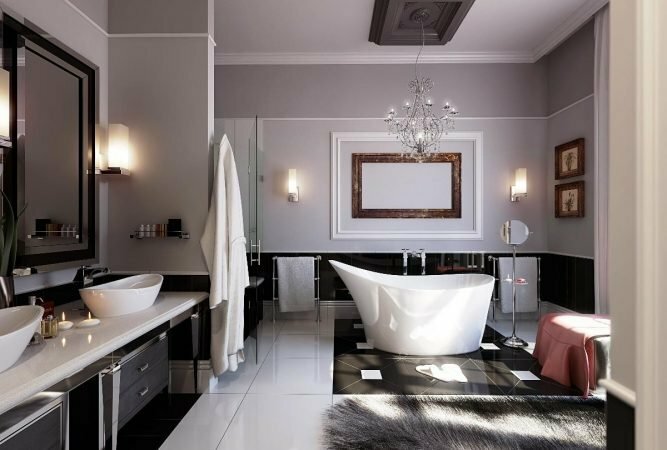 Here are beautiful luxury bathrooms and tips on how to achieve this in your bathroom. Marble in the bathroom elevates the room. 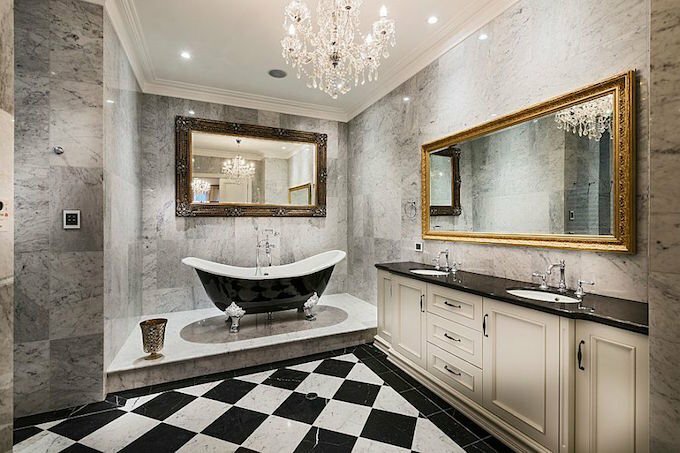 Marble floors and walls envelop this bathroom in grand style, while a shimmering crystal chandelier adds glamour. Gilded mirrors and a classic clawfoot bathtub enhance the space’s luxury appeal. 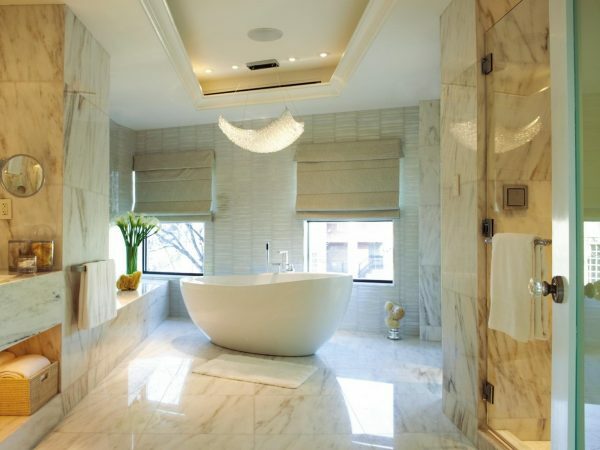 A more modern marble bathroom is simple in line and flow, while luxurious in feel. 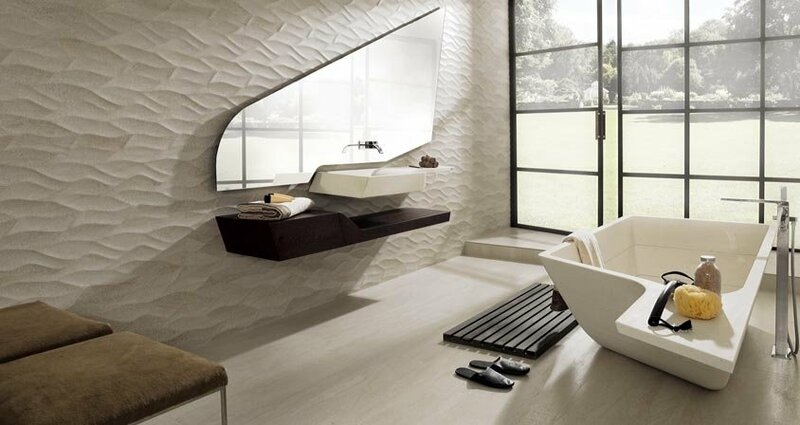 Soft tones lend warmth to this bathroom and the free-standing bathtub exudes modern comfort and relaxation. Sleek marble floors and wall trim give this bathroom a luxurious touch. 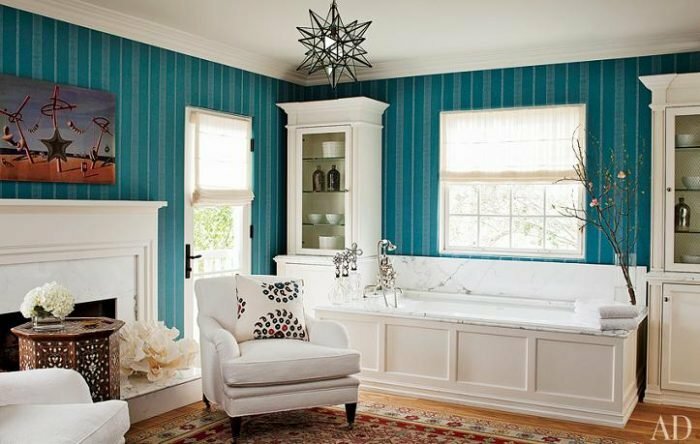 Wall molding marks off various shades of gray and gives a nod toward traditional trim. 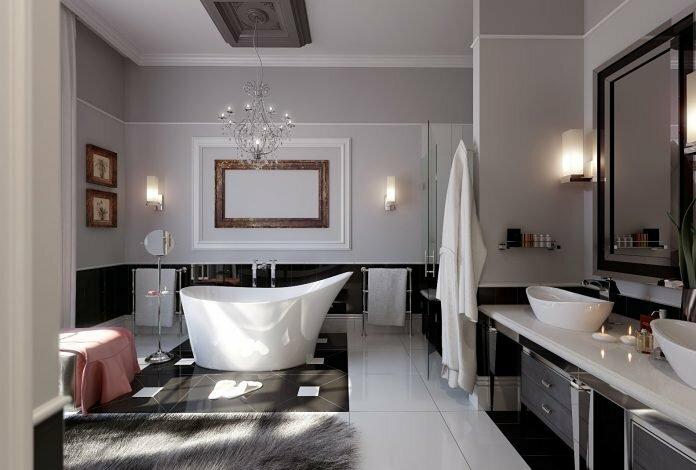 Modern light fixtures mix with a classic chandelier over the tub. 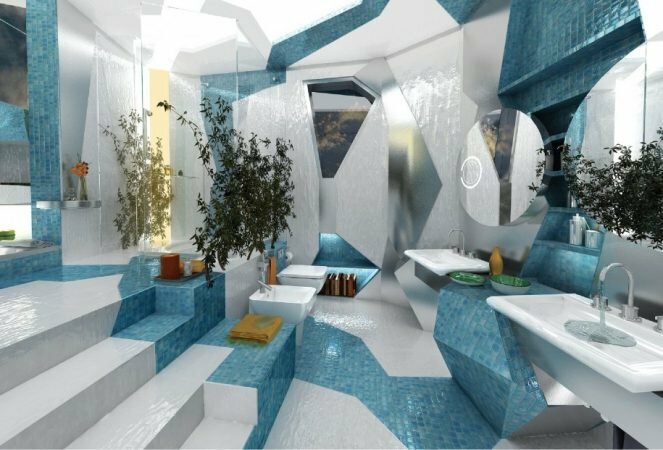 Tile installed in creative ways makes a bathroom space that is unique. Look for shapes and colors that appeal to you and create something out of the ordinary for your bathroom oasis. 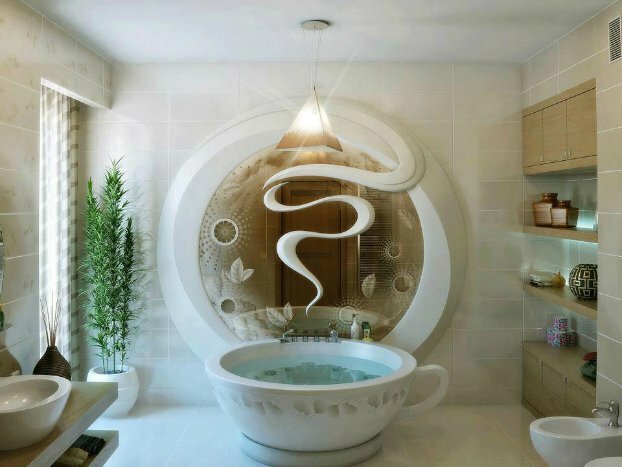 There’s nothing quite like a steaming cup of tea or coffee as you relax in the bathtub. Well, this bathroom takes it one step further with a tea-cup inspired tub and wall mirror design. 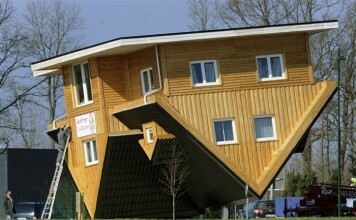 Take a bit of creative license with your bathroom design for a little something different. 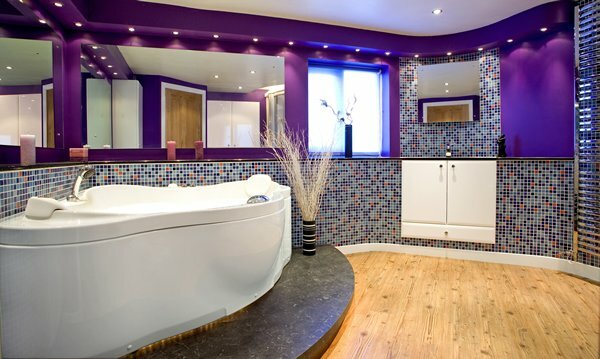 Color is a great way to add interest and drama to the luxury bathroom. Tile and paint can do wonders for a drab space. 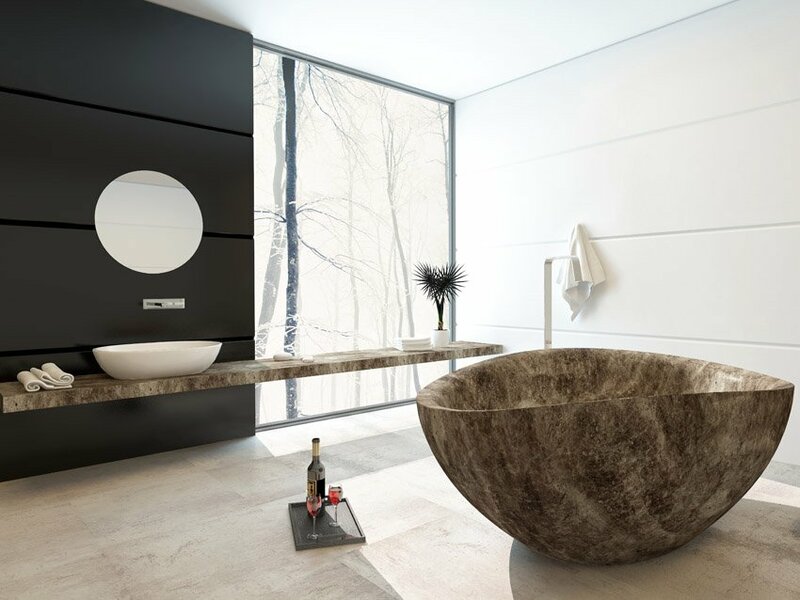 An elevated bathtub makes this fixture the feature of the space. Decorate your bathroom as you would any other room. 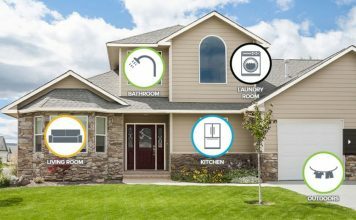 The trend in design today is to give your bathroom a more “room” appeal, including the addition of furniture and accessories. 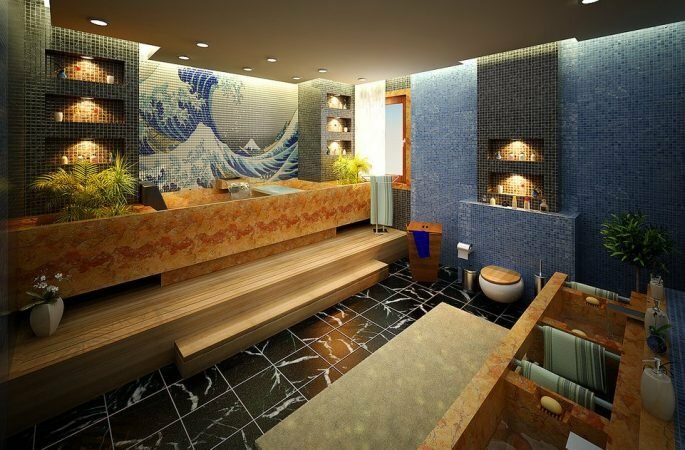 You can add paintings, sculpture and interesting wall treatments to achieve a more luxurious bathroom. A pleasing curve gives this bathroom great flow, while providing space for a vanity. 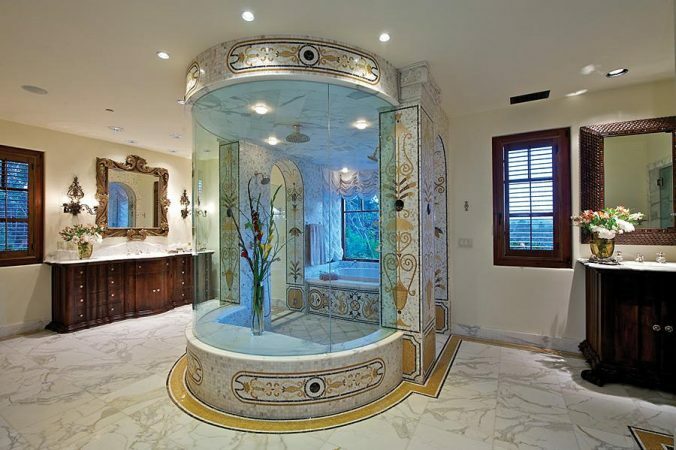 Carved out of the space is a roomy shower. The bath and shower take center stage in this luxury bathroom. 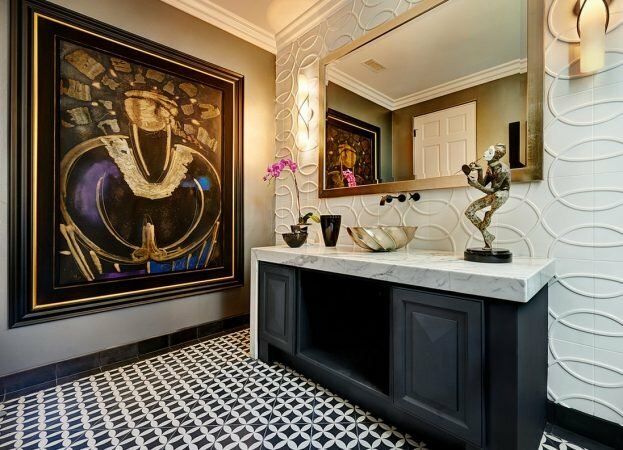 Intricate tile, marble surfaces and rich wood cabinetry give this bathroom an old-world glamour. 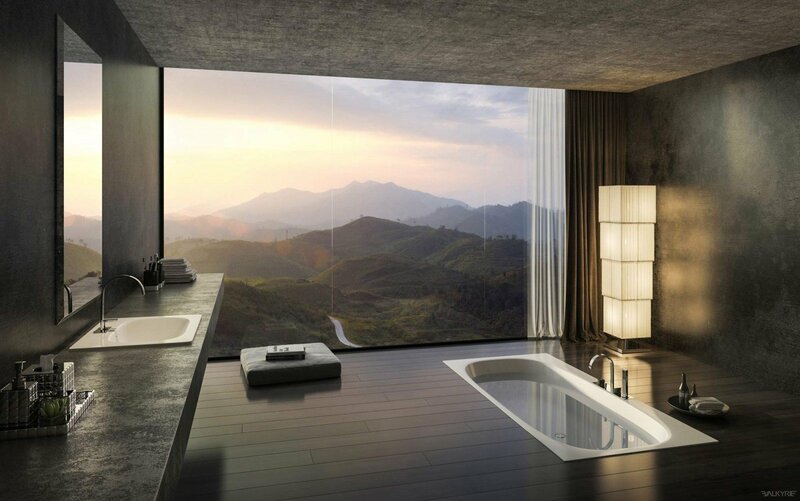 A view while soaking in the bathtub can be quite relaxing. 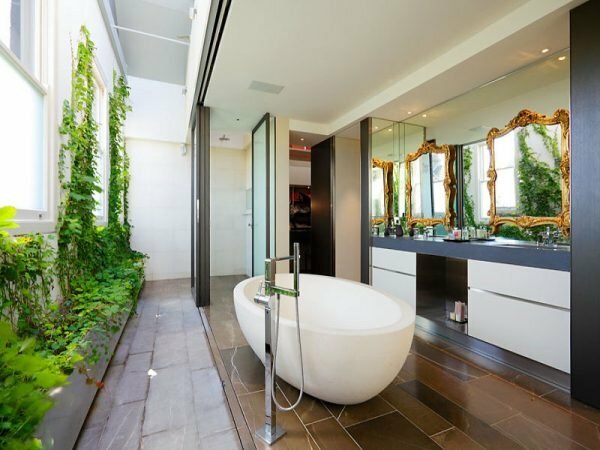 These bathrooms each have their own unique view and provide an extra level of appeal for a personal oasis in your home. 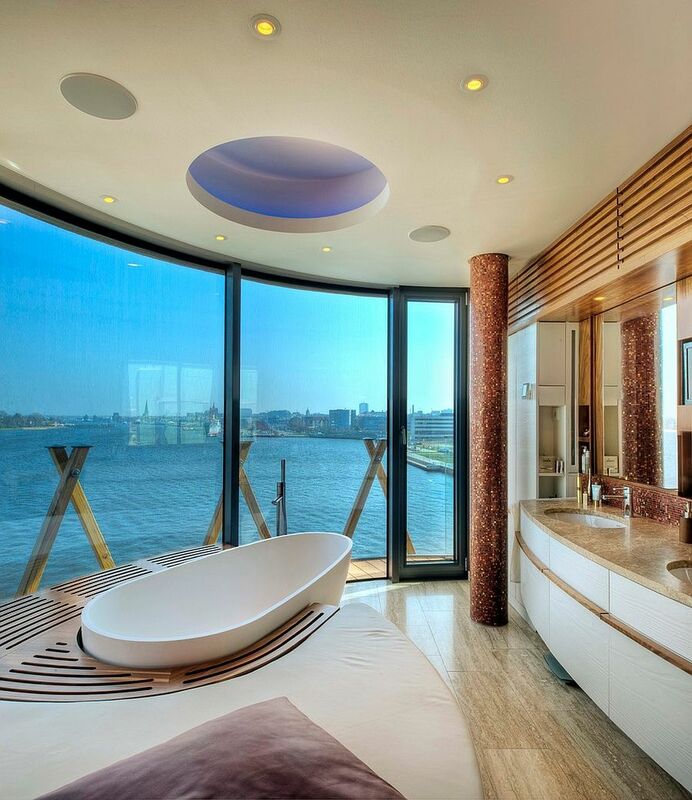 Luxury bathrooms can be a place to wind down and relax. 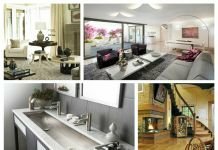 They can be an oasis, wrapping you in a cozy and glamorous world. 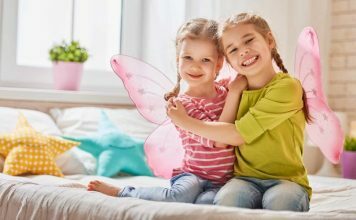 Think about upgrading the surfaces, adding furniture and accessories, unique bathtubs and sauna-worthy showers to create your own luxury bathroom.